In 2003, OJCF had the privilege of meeting Leah Spellman z"l, a truly unique individual. Among the many ways Leah was unique, she was the first person to establish a Jewish charitable gift annuity (CGA) through OJCF in 2003. This was a first in the State of Oregon for Jewish CGAs as well. Leah was born in Hastings, Nebraska but spent the better part of her life in Portland. A graduate of Lincoln High School and Behnke Walker Business College, Leah had a strong affinity for business and labor arbitration. Throughout her lifetime, Leah's commitment to her Jewish heritage never wavered. 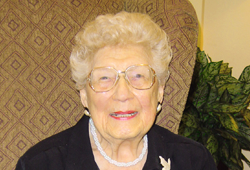 Upon retiring in 1981, Leah was particularly devoted to Robison Home, where she was a dedicated volunteer. She was also one of the first residents of Rose Schnitzer Manor, signing up before the project broke ground. Her deep feelings for the Robison Home grew as she saw the exemplary treatment her sister Sarah, a long-time resident, received. This inspired her to create a charitable gift annuity with OJCF, which allowed her to enjoy a secure income for herself and to create a meaningful endowment for Cedar Sinai Park and OJCF's Community Endowment Fund upon her death in 2005. "Leaving a legacy was very important to me. When I learned about OJCF, it seemed only natural to look into it further," Leah recalled in 2004. Through her generosity and pioneering spirit, Leah and her love for the Robison Home and Rose Schnitzer Manor live on forever.